I'm a hat girl; always have been, always will be. 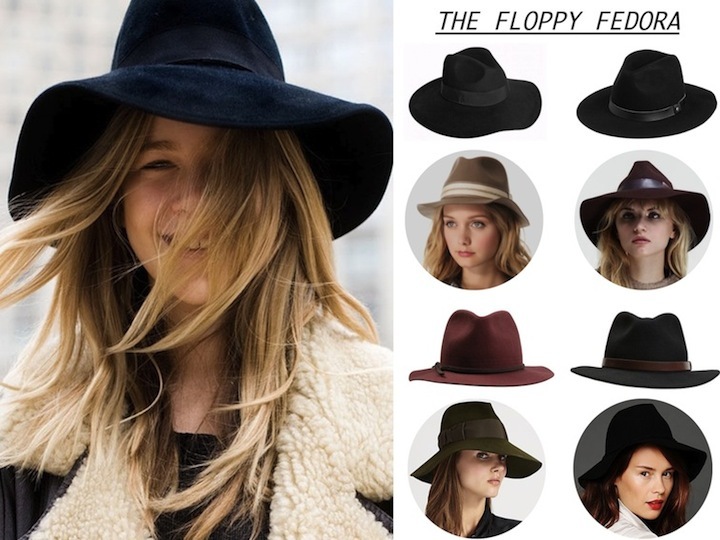 So of course, I couldn't be more excited about one of this fall's must have accessory - a floppy brimmed fedora. Choose a light wool version to camouflage a bad hair day or bring on the drama with a wide brim fedora. As a general rule the more floppy brim the hat, the more casual and a bit bohemian it seems. To play on the dramatic menswear trend this fall a wide brim with some structure but a hint of give is the hat to have. When it comes to nonchalant floppy brim fedoras, Rag & Bone is the most recognizable brand, and has been rocked by celebrities including Rosie Huntington and Emma Stone. I also love the wide brim fedoras by Lovely Bird and for a budget buy jewel tone floppy versions by San Diego Hat Company. I'd love a hat like this for fall-I especially love them in navy/burgundy! YES! I love fall and hats are one of the main reasons! Would love to find one that actually looks good on me! Love, love, love. These are so perfect for Fall. Fedora's are great for fall, perfect post. I love this! It's so sophisticated. FAB post! I am in loveeee with wide brim fedoras and these are such great suggestions! What a great post. For fall, my two favorite accessories are a great hat and a fab scarf! These are on my fall "want" list! Hah! I just bought my first floppy hat yesterday! Anytime I buy something similar to your roundups, I feel like I'm doing ok in the fashion world because you always have your finger on the pulse of what is fresh and trendy. awe, that is such a nice thing to say, thank you. I'm sure the hat looks super cute on you! I love my floppy fedora! Such a fall staple! I am ALL about a floppy fedora! As per usual, I'm drawn to the most expensive one in your roundup. *rolls eyes* Great post! I like it so much!!!! Want it for fall!